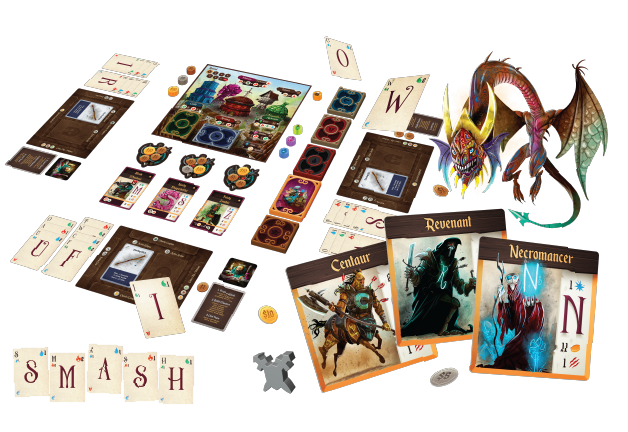 Harness the power of your vocabulary in this exciting, monster-battling, loot-collecting word game. In Spell Smashers, you combine your letter cards to spell words, smashing fearsome monsters and their even more fearsome adjectives! When you deal damage to a monster, you gain precious coins. When you defeat a monster, you collect that monster as a trophy … and gain a new letter to use later on! But beware — as you battle these dangerous creatures, you receive wounds, which are difficult letter combinations that could ruin your day. Between battles, visit the local town and spend your hard-earned loot to outfit yourself with powerful gear, take on new quests, buy devious potions, or grab an ale at the tavern as you boast about your battle scars. Set your sights on fame and glory as you smash monsters with your spelling skills and rid the world of evil!